For the interior designer who also happens to be a passionate chocolate lover, there are few things more inspiring than the texture, color and aroma of this fabulous sweet treat. 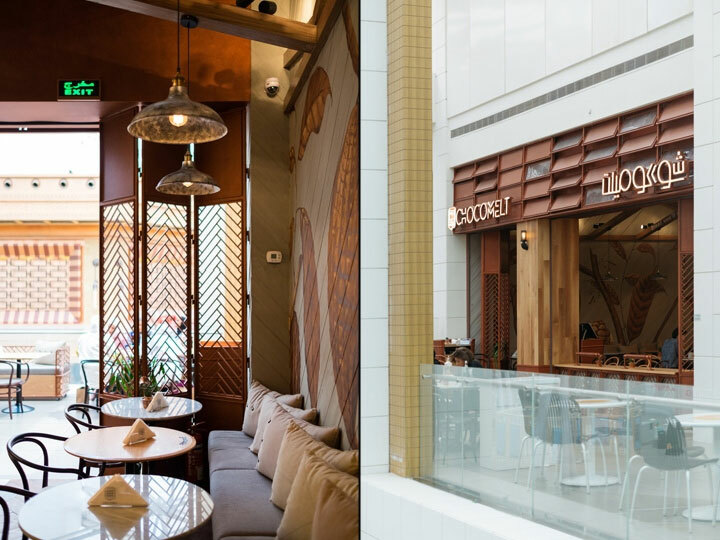 These combined passions can lead to beautiful results, as in the case of this coffee shop design in Kuwait. 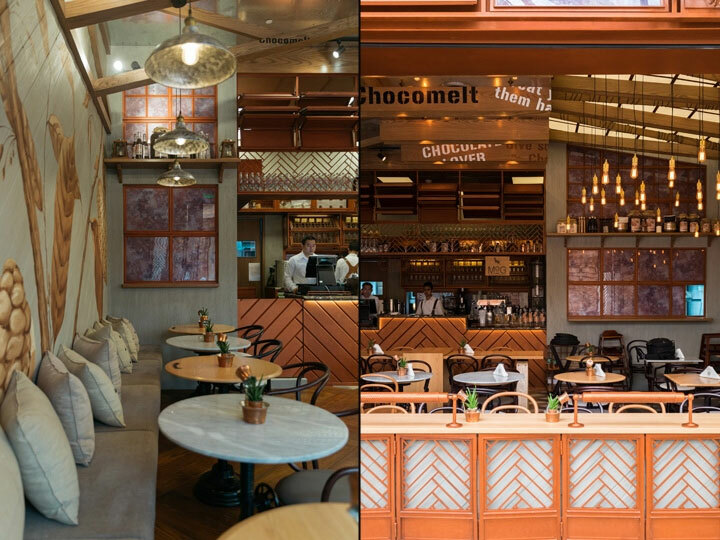 The Bangkok-based design consultancy firm party/space/design created the interior of Chocomelt, a chocolate café in the Avenue Mall. This is the second Chocomelt store in this location, but its interior is far from being an afterthought. 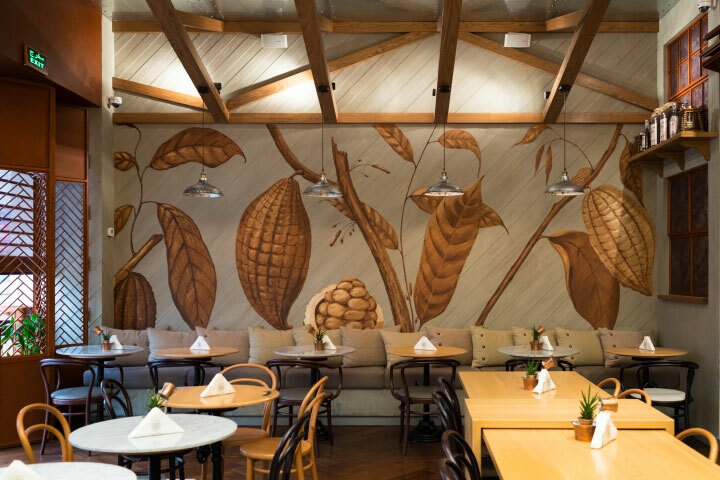 Inspired by the chocolate theme, the designers created a space that pays homage to the chocolate bar and cocoa bean. 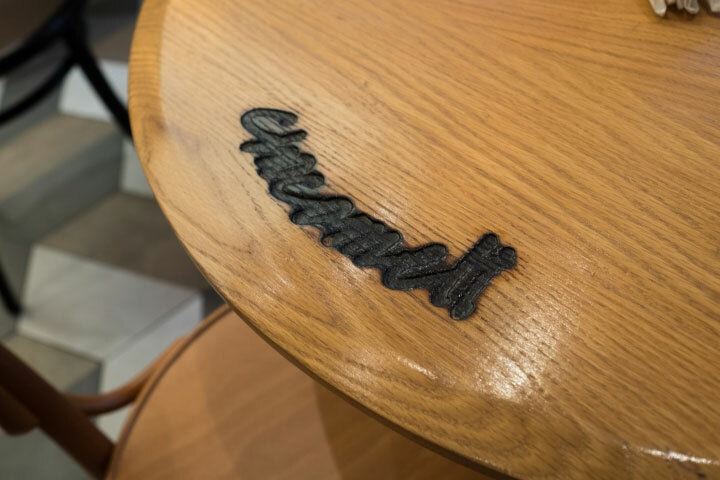 The Chocomelt company uses high-end cocoa beans and ingredients, and follows a careful process that preserves their quality and savor. The ingenuity behind their unique menu items is reflected in the unique character of the shop. 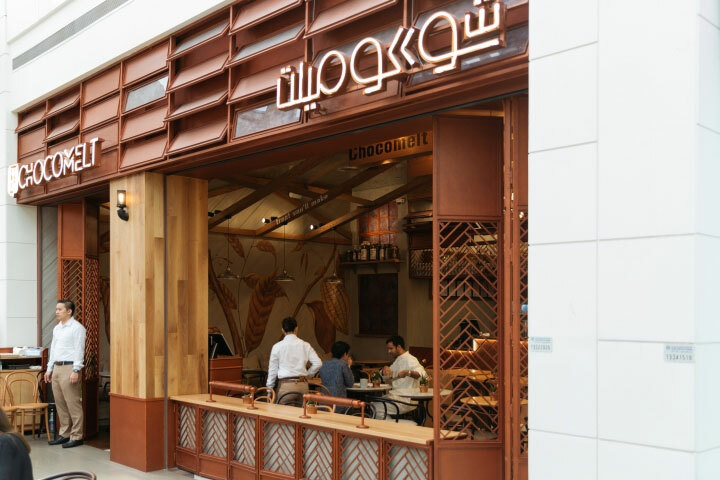 Keeping with the idea of turning the cocoa bean into a delicious treat, the designers imagined a place that evokes in part the look of a factory. The skylight, wooden beams and industrial lighting help in creating this particular vibe. 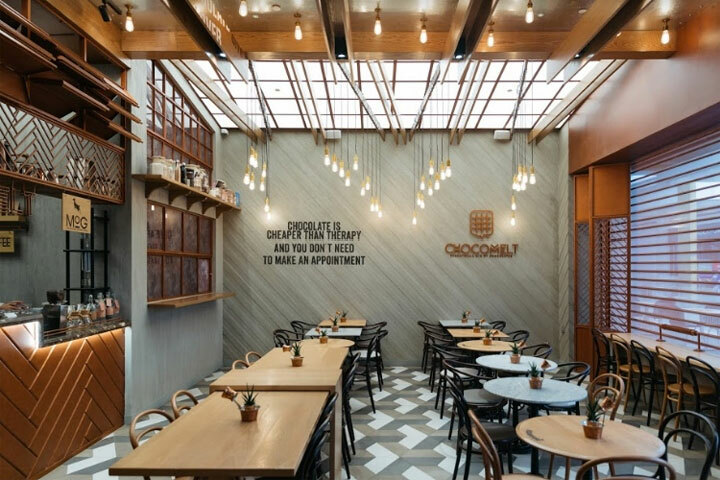 However, this coffee shop design departs from the industrial style and becomes sophisticated, complex, elegant and clean-looking. 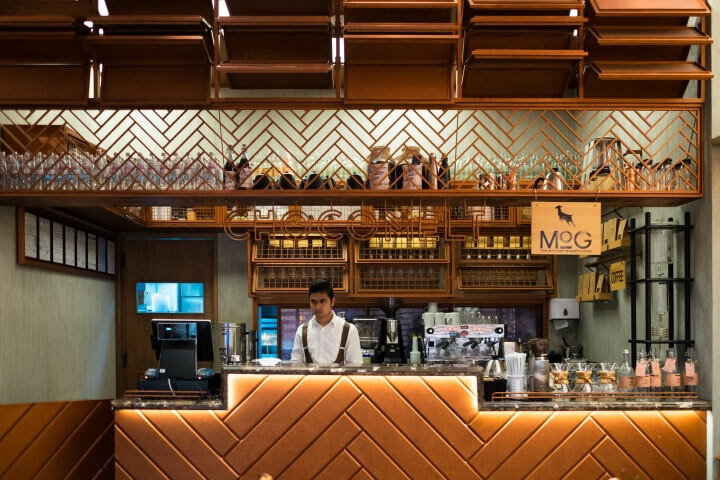 Brown tones are expected in a café focused on chocolate treats, yet the designers manage to warm up the palette even more by the smart use of lights and chromatic contrast. The zigzag pattern of the counter calls to mind images of chocolate bars on the verge of melting. The same motif appears as the unifying element all around the store, from the door and storefront to the semi-open shelf above the counter. The gray wall finish keeps with this earthy chromatic scheme and emphasize the industrial details. It provides a cold-toned background against which the warm hues of the oversized chocolate-bean graphics stand out. Rows of rotating wooden boards reminiscent of chocolate squares play a double role, looking decorative while creating an appetite. 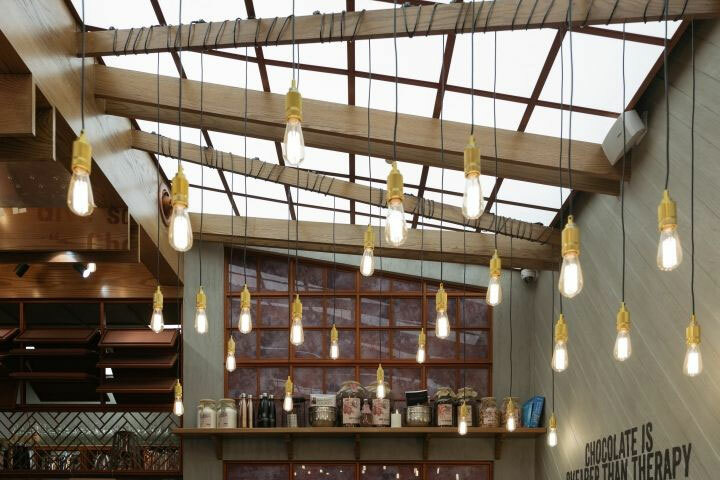 The beauty of this coffee shop design lies in the complexity of the multilayered interior. While the tables are modern, the wooden beams introduce a familiar rustic note. Urban touches mix with the traditional lines of the chairs. 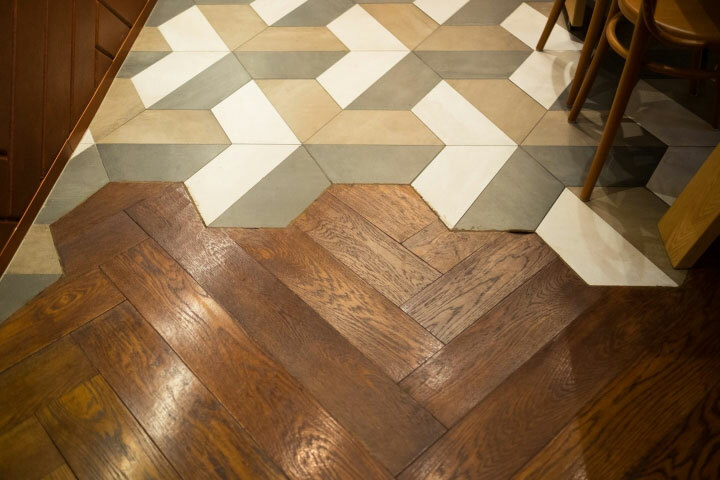 In another combination of modern and traditional, the floors bring together the natural, warm texture of wood and the cold, earthy-colored geometric tiles. It is a design that invites a second look and that manages to offer something new and surprising in every detail.